As of spring 2015, I have discovered, isolated and classified a total of 32 supersyllabograms in Mycenaean Linear B, having found no new ones since autumn 2014. Let us review supersyllabograms, what they are, the 2 different types & how they are classified & sub-classified. In Mycenaean Linear B, a supersyllabogram is almost always the first syllabogram only, in other words, the first syllable only of a Mycenaean Greek word or phrase. There are only three (3) exceptions to this operative principle. The 32 supersyllabograms account for more than 50 % of all syllabograms in Mycenaean Linear B. That this is a very significant subset of this discrete set of syllabograms goes without saying. An independent supersyllabogram is one which stands alone, all by itself, on any Linear B tablet. 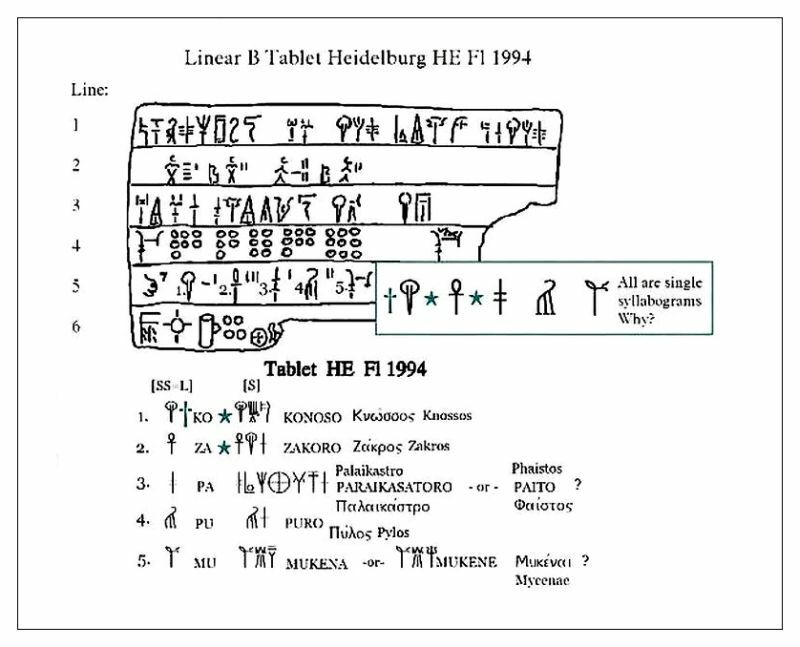 There is just the one syllabogram, with nothing preceding or following it, except whenever several of them appear in a series, as on Linear B tablet Heidelburg HE Fl 1994. And even then, strictly speaking, they still stand alone, each one being a discrete entity naming only one thing, a city or settlement name. (a) first by Prof. John Chadwick, who deciphered the syllabograms NI = suko (figs) & SA = rino (flax), and the homophone RAI = kanako (crocus or saffron) in his ground-breaking book, The Decipherment of Linear B (1959,1970), in which he divulged to the world the arduous road over several years to the decipherment of Linear B in 1952 by the brilliant cryptographer, Michael Ventris. 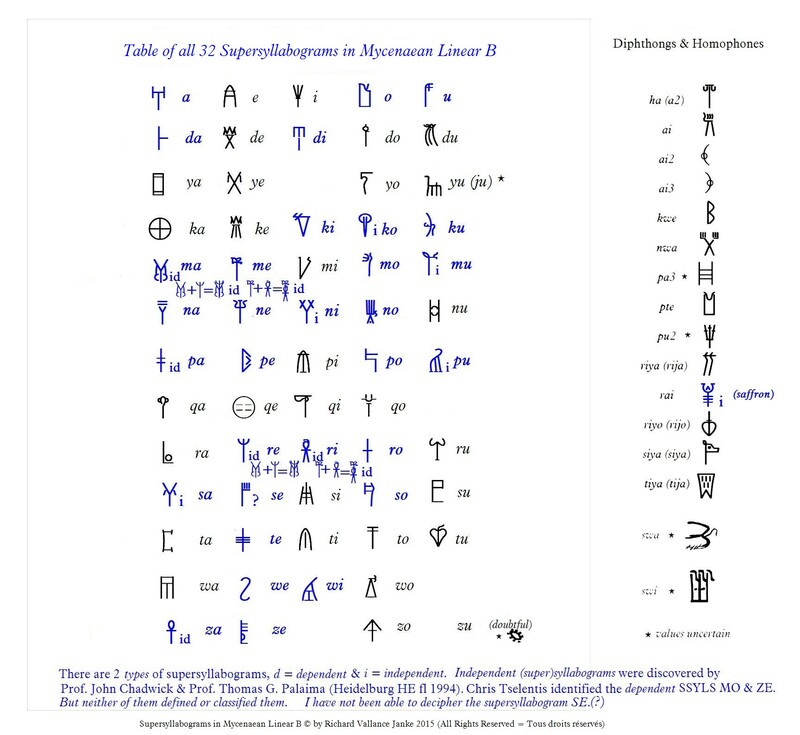 It is essential to realize that these three independent supersyllabograms alone are the only ones for which the single syllabogram symbolizing the Mycenaean Greek word they each replace is not the first syllabogram, i.e. the first syllable of that word, as we can clearly see with NI, SA & RAI. This being the case, the remaining 29 supersyllabograms of a total of 32 are, by default, the first syllabogram of the Mycenaean word or phrase each of them represents. In this case, all 5 of the independent supersyllabograms, KO, ZA, PA, PU & MU are the first syllabogram, i.e. the first syllable of a Minoan or Mycenaean city or settlement name. While these 5 independent SSYLS appear in sequence, each one should and must be interpreted as standing alone in its own right. There are thus a total of 3 + 5 = 8 independent supersyllabograms (i). However, it is absolutely essential to understand that some of these 8 SSYLS are also dependent (d). I am obliged to point out that neither John Chadwick nor Thomas G. Palaima recognized or identified these 8 supersyllabograms as such, since after all, one of them (Chadwick) discovered only 3 syllabograms which fit this description, while the other (Palaima) hit upon only 5 more. In retrospect, we have to be honest with ourselves and admit that it would be unrealistic, if not downright disingenuous, to expect them to have isolated supersyllabograms in the first place, given that they only just happened to stumble upon these 8, all of which are independent SSYLS, and none of which fit into the default paradigm of the rest of the supersyllabograms, all of which are dependent (d). In a word, neither of them could conceivably have even identified a phenomenon one could call the supersyllabogram, because they did not find any others. And it was the others, of which there are so many, that were, as we say, the real McCoy. If there is only one (1) dependent supersyllabogram (d) adjacent to only one (1) ideogram, that ideogram, upon which that SSYL depends, determines the exact meaning of the SSYL. 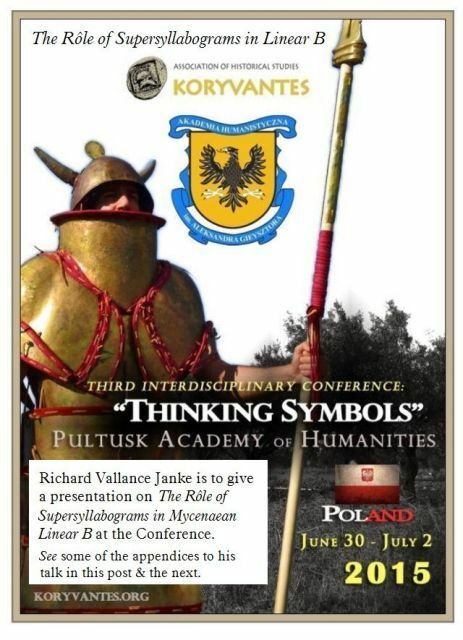 Change the ideogram, change the meaning. In other words, the meanings of all dependent supersyllabograms (d) are determined by the specific ideogram to which they are adjacent. The meaning of any adjacent dependent SSYL must therefore be strictly contextual (dc). More than one dependent supersyllabogram can be adjacent to one or more ideograms, and in any order. However, the order in which the SSYLS & the ideograms appear together is never random. It is always structurally contextual. Change the order, change the meaning. Dependent supersyllabograms are sub-classified as either associative (as) or attributive (at). (1) Associative dependent supersyllabograms (as) are those which are immediately adjacent to the ideograms upon which they depend. An associative SSYL is one which informs of us of some external element, for instance, the factor of land tenure relating to the ideogram itself, or one which circumscribes its environment, especially in the livestock raising sub-sector of the agricultural sector. For instance, in the Table of All 32 Supersyllabograms in Mycenaean Linear B above, the supersyllabogram O adjacent to the ideogram for sheep + the number of sheep accounted for in the inventory of any particular tablet, informs us that the sheep are being raised on a lease(d) field, more specifically a usufruct lease field (i.e. a lease field which a farmer tenant cultivates for the use of his own family and village neighbours, with a taxation imposed by the overseer). In other words, the supersyllabogram O = onato (lease field) is associated with the raising of x no. of sheep. (2) Attributive dependent supersyllabograms (at) always appear inside the ideogram which they qualify, never adjacent to it. They always describe an actual attribute (usually known as an adjectival function) of the ideogram. For instance, the syllabogram PO inside the ideogram for “cloth” is the first syllabogram, i.e. the first syllable of the Mycenaean word ponikiya = “purple”, hence the phrase = “purple cloth”. Likewise the syllabogram TE, when it appears inside the ideogram for “cloth” is the supersyllabogram for the Mycenaean word tetukuwoa, which means “well prepared” or if you like, “well spun”. Hence, the syllabogram TE inside the ideogram for cloth must mean one thing and one thing only, “well-prepared cloth”. I have discovered, identified & classified well over a dozen examples of associative supersyllabograms. The first person to identify and correctly translate two of the most frequently occurring supersyllabograms was Chris Tselentis, who deciphered the two SSYLS ZE & MO on Knossos Tablet KN So 4439, in the appendix TEXTS of Linear B tablets of his excellent Linear B Lexicon. On this tablet, which is strictly military, these syllabograms each appear immediately adjacent to the ideogram for chariot wheel, ZE appearing after the ideogram, and MO before it. It was obvious to Chris Tselentis that, in the military context of this tablet, the syllabogram ZE could mean one thing and one thing only, “a pair of (wheels)”, while MO could only mean “a single wheel”. And he was bang on. Unfortunately, he had his hands full just compiling his comprehensive Lexicon, and so he never got around to a thorough examination of a large enough statistically significant cross-section of Linear B tablets, to ascertain whether there were any more like this one. But there were – plenty more, in fact some 700 of 3,000 Linear B tablets I meticulously poured through from the corpus at Knossos. If it weren’t for Chris Tselentis in particular, or for John Chadwick and Thomas G. Palaima before him, I would never have followed my intuition to ferret out more examples of the same phenomena, only to be so richly rewarded for taking this decisive step in the first place in the winter of 2014. There was no guarantee that anything concrete would come out of my year-long investigations. But it did, to say the very least. The ultimate result of my painstaking search through 3,000 tablets from Knossos, and the meticulous research which ensued were to pay off in droves. The Table you see above is the true fulfillment of a hard-won struggle.